The art of tattoos has opened new doors of expressions. Now people love to express their feelings of love, honor and devotion to someone with the help of tattoos. Especially, the trend of couple tattoos is increasing day after day as more and more couples are getting special tattoos just to express their mutual feeling of love and affection for each other. Couple tattoos are not much different as compared to normal tattoos but artists try to collect and pour the feelings of love between the couple into their designs. These tattoos can contain couple’s name, their portraits or one similar design on both of their bodies. 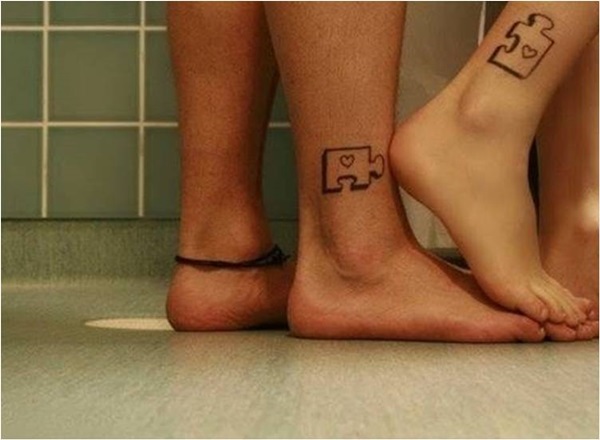 Usually, such tattoos are not made visible to everyone and the couple may have these tattoos just for each other. But most of the time, you may observe couple tattoos made around wrists, lower arm, shoulder, chest, belly or even sometimes around neck. However, the destination body part for a couple tattoos is couple’s choice but the only and only motive of these tattoos is to express their mutual love with each other and exhibit their special feelings for each other to the peers. You may have matching tattoos as couple tattoos but the key idea of this tattoo scheme is inking one tattoo on two bodies bind in a deep relationship. Siblings can have flowers, butterfly or vine images and these images are popular among sister couples. However, brothers love to have cross tattoos, zodiac tattoos, rock bands, barbed wires or other such symbols. Best friends can even have couple tattoos and carbon images are popular among friends or they used to have friendship quotes. Married couples usually love to have painting tattoos inked on their bodies including hearts, angels, Celtic love knots or cupids. There are plenty of choices but be sure to consult your partner before asking for one. Good luck!